Colbert Nation sure showed up in force to welcome back its leader. Tuesday's extra-long debut episode of the "Late Show with Stephen Colbert" averaged 6.6 million viewers, according to CBS. The "Late Show" was the top-rated show in late-night -- an unsurprising result since Colbert's premiere had been promoted and anticipated for months. Jimmy Fallon's "Tonight Show" on NBC averaged 2.9 million viewers. Colbert's 6.6 million total also beat most of the prime time shows on other networks. CBS said its web site for the "Late Show" "experienced its highest premiere day traffic ever and streams of the full episode are up triple digits compared to last year to date." 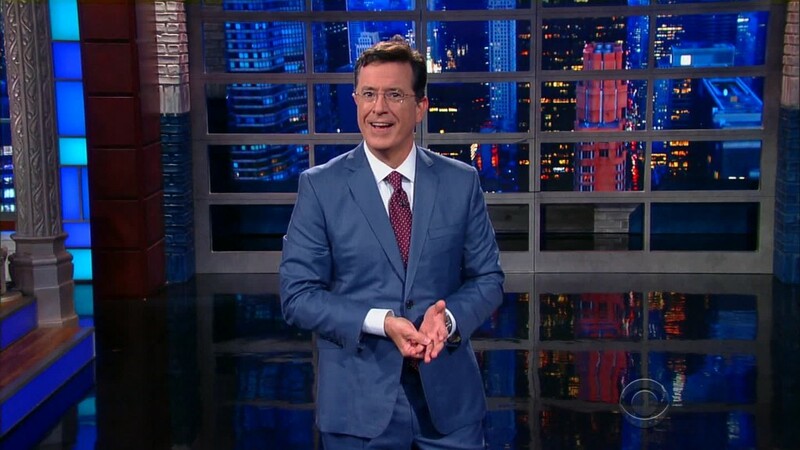 One of the network's goals with Colbert was to make the show more web-friendly. Colbert's predecessor, David Letterman, retired in May. His final episode was watched by 13.7 million viewers, his biggest single audience since 1994. Letterman typically attracted 2 to 3 million viewers a night. Colbert comes from the Comedy Central cable channel, which has a much smaller audience than CBS. When Colbert ended his "Colbert Report" in December, the comedian attracted 2.5 million viewers, a record for him at the time. To open Tuesday's show, Colbert showed a pre-taped segment that had him singing the Star Spangled Banner at a ball game. The big surprise, however, was that the umpire was none other than Colbert's long-time Comedy Central colleague, Jon Stewart. Critical reception for the premiere was mostly upbeat. Fans and critics alike were happy to see Colbert -- and his absurdist humor -- back on the airwaves, even if the debut seemed at times like an overstuffed hour-plus of television. "It was not a rigidly composed plate but a groaning board, built less around a concept then around a vibe of smart fun and an urge to show off its host's many skills," wrote The New York Times new TV critic James Poniewozik.